Can Rabbits Eat Bananas ? It is a good thing to feed fruits and vegetables to rabbits as a part of a healthy diet. Usually, rabbits like to eat different foods which help to keep them happy and healthy as well. However, before feeding something to the rabbit you need to ensure that the food fed to the rabbit is healthy or not because it is the only unhealthy food that affects the health of rabbits more than other factors. This is the reason that people are confused about feeding bananas to the rabbits. We have found most of the people usually ask one question that can rabbits eat bananas? The simple answer to this question is yes. But there are still many things that need to keep in mind. 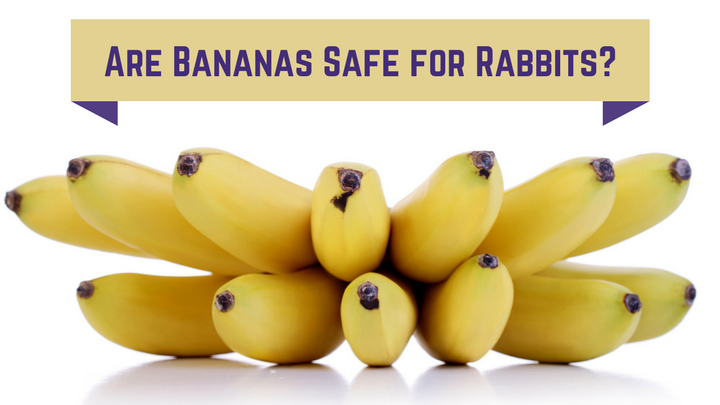 If you want that banana does not prove to be harmful to your rabbit’s health and to know more about feeding bananas then continue reading this article. Can rabbits eat bananas safely? Do rabbits like to eat bananas? Can rabbits eat bananas skin and leaves? How should be fed a banana to the rabbit? The rabbit owners often ask that can rabbits eat bananas? The simple answer is yes, they can eat bananas. According to the veterinarians, rabbits can eat bananas safely but as a rare treat. However, this fruit is free from chemicals that are harmful to rabbits health. So, if you have fed bananas in excessive amounts ever, then there is no need to be worried or no need to carry the rabbit to the animal hospital. The veterinarians say that if more pieces of banana are fed at one time, still, they do not cause permanent damage. But regular use of bananas in excessive amounts can be very harmful for the health of rabbits. As a result, rabbit owners need to be careful while feeding bananas. When people ask that can rabbits eat bananas, we recommend that bananas should not be larger than adult’s thumb. Feeding bananas to the rabbits, is as simple as other fruits but they can eat it safely only in very small amounts. You need to take some precautions while feeding the bananas to your rabbit so that rabbits can be protected from health problems. So implementing the general guidelines for the amount of the fruit safely, depends on the weight of the rabbit. According to the veterinarian Rick Axelson, you should feed 1-2 tablespoons of fruit per every five pounds of body weight per day. It means a tablespoon of fruit is enough for 5 pounds rabbit every day. This rule applies not only to bananas but also to all fruits. If you have a baby rabbit, you should not feed them bananas as well as any kind of fruits until they reach the age of 12 weeks. The main reason for this is their sensitive digestive system. Also, if you are feeding a banana to the rabbit for the first time, do not feed it more than 1 tablespoon in a day because it is necessary to know the reaction of the rabbit after feeding it at the first time. That’s why diet changes should be applied slowly because you do not know how your rabbit will react. Can rabbits eat bananas, after knowing the answer to this question, let’s know do rabbits actually like to eat bananas? The answer is yes and we were sure that you will be happy certainly to hear this answer. However, it is commonly found that rabbits love bananas so much that it can prove to be difficult for you to resist bananas feeding. Rabbits like to eat bananas very much, it has been revealed by the Purdue University of Veterinary Medicine. They have warned rabbit owners against feeding bananas because according to them, banana not only causes of the health problems but also makes the rabbits addicted. The relationship between bananas and rabbits is exactly like humans and ice cream. Rabbits may find it difficult to take one bite for the first time but after that, they find it as delicious as much as they eat. Therefore we recommend you to resist to feed them more bananas. There are many animals who like to eat banana peels, including rabbits but the question is whether rabbits can eat banana peels safely? As far as we think you should be a little careful when feeding bananas to the rabbits because the rabbit has no special need to eat banana peels, so you should not take any risk. According to the veterinarians, “neither the banana peels are toxic for rabbits nor these are recommended for feeding essentially”. But if you still want to feed the banana peels to rabbit then only a small amount of peel is considered safe. If your rabbit eats a little amount of peel with a banana then there is nothing to worry about but do not let the rabbit reach the entire peel. Also, now you may also want to know that can rabbits eat bananas leaves? You may know that the veterinarians recommend feeding leafy greens regularly as it is a part of a healthy diet. However, there is little confusion about feeding banana leaves to the rabbit. The scientists have studied as potential rabbit feeds on banana leaves. They found that it can be fed as a part of a balanced diet. If you want to feed banana leaves occasionally you can feed because pesticides are not sprayed on banana leaves. You will be happy to know that the leaves are not harmful to your rabbit. Still, before chopping up the leaves to balance the rabbit’s diet, consult a veterinarian once. Do not feed fruits or vegetables until your rabbit is 3 months old. Feed the fruits or vegetables to the rabbits only as a treat. It means that try to feed it in a small or recommended quantity as far as possible. Before feeding vegetables or fruits, you should feed hay for about 2 weeks. Many kinds of fruits or vegetables should not be fed at a time. If you are going to feed fruit to the rabbit for the first time, after feeding, wait up to 24 hours to know the reaction of the rabbit. If you find the rabbit upset then stop feeding. Change their fruits as much as you can. The first thing is that the rabbit should be avoided from those foods that are high in sugar content. Bananas also come under those foods. Before feeding bananas, you should keep in mind that rabbits love to eat sweet foods. As a result, regular consumption of bananas can make them addicted to it. A substandard diet often arises severe problems. Due to the rabbit digestive system being quite complex, they have to face difficulties in digesting excessive sugar quantities. Starch is found in large amounts in banana which is very harmful to the intestines of rabbits because their intestines are not able to digest fatty and sugary substances. The small amount of fiber in banana causes various problems such as diarrhea and constipation. If the rabbit goes into serious condition due to excessive consumption of bananas, gastrointestinal problems may also increase. They suddenly start refusing food and water which proves quite fatal. If you find something like this, stop feeding bananas immediately. If you still do not get any improvement in their condition, consult a veterinarian without delay. If you wait too long then it can prove to be fatal for your rabbit’s life. Also, by eating more banana, they lose interest in eating hay. However, hay is the only food that plays an important role in meeting the lack of essential nutrients. If your rabbit doesn’t eat enough hay, there is found a special lack of essential nutrients in their body. Nutrient deficiencies lead to many health problems. Always keep one thing in mind if your rabbit is already overweight then avoid giving it any fruit. However, you can feed it to healthy rabbits as a treat. Can rabbits eat bananas? We are sure that in order to clarify the answer to this question, we have provided complete information in this article. Now you will have known that banana can be fed to the rabbit as a treat. However, regular use in excessive amounts of banana can be harmful to them. At the end of this article, in spite of all the information, you still think we should have added more content in the article; you are free to leave your question in the comment section. ← How Much Does a Pet Rabbit Cost?